Helps rule out pulmonary embolism. Use in hemodynamically stable patients ≥18 years old. Hemodynamically stable patients ≥18 years old with clinically suspected acute pulmonary embolism (PE). Note: this study included patients with suspected acute PE in both inpatient and outpatient settings. Consists of the three most predictive criteria of the Wells' Score for PE: clinical signs of deep vein thrombosis (DVT), hemoptysis, and whether PE is the most likely diagnosis. Also incorporates variable D-dimer thresholds, depending on the number of criteria fulfilled. 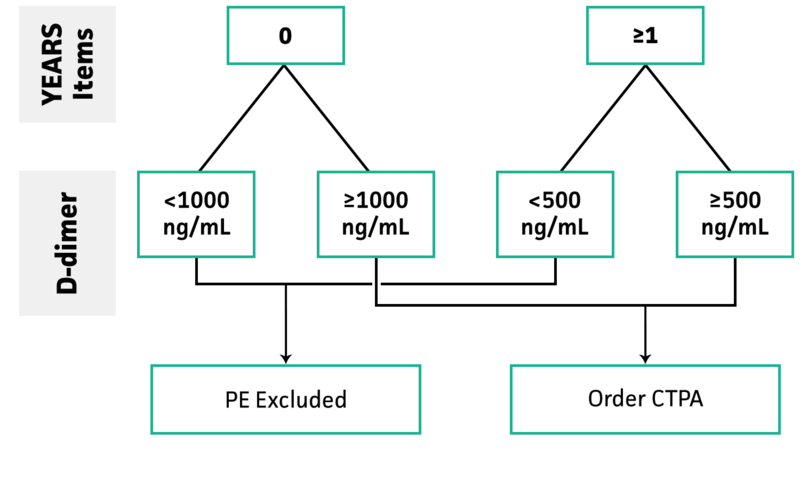 In patients with no YEARS items and D-dimer <1,000 ng/mL, or with one or more YEARS items and D-dimer <500 ng/mL, PE was considered excluded. All other patients had CT pulmonary angiogram (CTPA). Reduces use of CTPA by 14% compared with the current standard algorithm (absolute reduction) and by 8.7% compared with the age-adjusted D-dimer threshold, such that patients younger than 50 years also benefit from the YEARS algorithm. Provides for simple and efficient diagnostic management of patients with suspected PE, and is more compatible with the demands of clinical practice. Reduces false positives, overdiagnosis, and overutilization of CTPA investigations in all age groups, in addition to reducing unnecessary exposure to ionizing radiation. PE was excluded (and CTPA deemed unnecessary) in patients who who fell below the D-dimer thresholds set by the YEARS algorithm. 3-month incidence of venous thromboembolism (VTE) of patients who did not undergo CTPA was 0.43%. This is similar to the traditional two-tier Wells' Score (0.34%). Then, check D-dimer. Thresholds depend on number of YEARS items present (see decision tree below). Adapted from Van der Hulle 2017. Prospective cohort study conducted in 12 hospitals across the Netherlands in hemodynamically stable patients with suspected pulmonary embolism. The algorithm was applied by first evaluating the presence of YEARS items: clinical signs of DVT, hemoptysis, or PE most likely diagnosis. All patients underwent a D-dimer test. In patients with no YEARS items and D-dimer <1,000 ng/mL, PE was excluded and no CTPA was performed. In patients with one or more YEARS items and D-dimer <500 ng/mL, PE was excluded and no CTPA was performed. All other patients received CTPA. Primary outcome was number of venous thromboembolism (VTE) events during the 3 months after PE was excluded and was analyzed using per protocol approach. The secondary outcome was the number of required CTPA compared to Wells’ Score for PE, analyzed using an intention-to-treat analysis. 3,616 patients with clinically suspected PE were screened, and 3,465 were included in the study. 18 (0.61%) were diagnosed with a symptomatic venous thromboembolism during the 3 month follow up. 6 of those patients had fatal PE (0.21%). 2,946 patients (85%) were ruled out for PE using the algorithm. Of 1,629 patients who were ruled out without CTPA, 7 (0.43%) had symptomatic venous thromboembolism during the 3 month follow up, 2 of which were fatal. 1,317 (15%) of patients were managed with CTPA. Of those patients, 11 (0.84%) had symptomatic venous thromboembolism during 3 month follow up, 4 of which were fatal. When compared to Wells’ Score with fixed D-dimer of 500 ng/mL, the YEARS algorithm reduced CTPA by 14% across all ages and subgroups. It appears as though the binary D-dimer cutoffs used in the YEARS trial reduced the rate of CTPA when compared to using age adjusted D-dimer. If age adjusted D-dimer was applied, the YEARS algorithm would have led to an absolute reduction of CTPA by only 8.7% compared to 14% using the binary cutoffs of the YEARS algorithm. Age adjusted D-dimer, defined as age x 10 in patients over the age of 50, has been prospectively validated to be safe and reduce the number of CTPA in patients low risk for PE. The authors of the original YEARS study published a subgroup analysis of the patients 50 years and older and compared this subgroup to the age adjusted d-dimer cutoffs. In the YEARS study, 1,651 (48%) patients aged 50 years and older were managed without CTPA. If the age adjusted D-dimer cutoffs had been applied to the YEARS subgroup, 1,627 patients (47%) would have been managed without CTPA. This adjustment lead to an absolute increase of CTPA by 0.69%. This increase in CTPA did not result in a higher sensitivity but rather would have missed 4 PEs in patients that were confirmed on CTPA as they had one or more YEARS items and D-dimer >500 ng/mL in the original YEARS study. The authors concluded in the YEARS cohort, there was no added value of implementing age adjusted D-dimer in the YEARS algorithm. Kabrhel C, Van hylckama vlieg A, Muzikanski A, et al. Multicenter Evaluation of the YEARS Criteria in Emergency Department Patients Evaluated for Pulmonary Embolism. Acad Emerg Med. 2018;25(9):987-994. Van der Pol LM, Van der Hulle T, Cheung YW, et al. No added value of the age-adjusted D-dimer cut-off to the YEARS algorithm in patients with suspected pulmonary embolism. J Thromb Haemost. 2017;15(12):2317-2324. Righini M, Van es J, Den exter PL, et al. Age-adjusted D-dimer cutoff levels to rule out pulmonary embolism: the ADJUST-PE study. JAMA. 2014;311(11):1117-24. Tom van der Hulle, MD, is an internist in the department of thrombosis and hemostasis at Leiden University Medical Centre in Leiden, Netherlands. His primary research interests involve hematology, oncology, and pulmonology.